Nick, on his way to work at the City of Burbank. The BTMO welcomes you to our new monthly series! Burbank commuters come in all kinds. People bike, walk, bus, scoot, carpool, vanpool and drive. Here we will share the stories of commuters who live and/or work in Burbank. We aim to share stories that demonstrate it is possible to reduce our dependence on driving alone! Our series’ first model commuter is Nick Burant. Nick works in the City of Burbank’s Community Development Department, and sometimes he takes the scenic route! How do you get to work on a typical day? 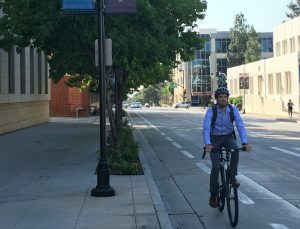 I typically bike from my apartment in Echo Park to Union Station and take Metrolink to the Downtown Burbank Metrolink Station. Every so often I do the whole commute on my bike by riding through Griffith Park. What is the best part of your commute? When I take Metrolink it’s the train ride. It’s on time, it’s quiet, and it’s smooth. When I bike the whole commute I enjoy the stretch through Griffith Park mainly because I don’t have stop at any stoplights. It’s also a nice release from the stress of the day to bike home. What/who compelled you to begin commuting this way? I’ve never really liked to commute by driving. I grew up in Washington DC and took public transit to middle school and high school; I’m accustomed to and like taking transit. Burbank’s City offices are close to the Downtown Burbank Metrolink Station and I live close to Union Station. Burbank has a robust Employee Rideshare Program that helps defray the cost of Metrolink tickets. Biking and taking Metrolink also saves me quite a bit of wear and tear on my car and lowers my insurance costs. I had to encourage a coyote to get out of the road while I was biking through Echo Park. It did so reluctantly. Are there any commuting tips that you’d like to share with people working near you? Take advantage of public transit! Metrolink runs through Downtown Burbank pretty frequently in the morning and afternoon and is pretty reasonably priced, and LA Metro has lots of routes that either end in Downtown Burbank or pass through it.